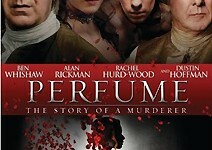 Based on the bestselling novel by Patrick Süskind, "Perfume" is a story of murder and obsession set in 18th-century France. Jean-Baptiste Grenouille has used his unique talent for discerning the scents and smells that swirl around him to create the world's finest perfumes, but his talent masks his burden. An orphan from birth, Grenouille has always felt alone in the world and different from any other person. Determined to connect with others, Grenouille tries to capture the irresistible but elusive aroma of young womanhood, traveling far and delving deeper into the intricate science of perfume-making. As he becomes increasingly – and recklessly – passionate about his art, his obsession to create the world's most powerful fragrance takes a deadly turn. Ben Whishaw, the young British actor who received rave reviews for his performance in "Hamlet" at the Old Vic in London, stars in the central role of Jean-Baptiste Grenouille, the murderer on the hunt for the perfect scent. The film also stars Emmy and Golden Globe winner Alan Rickman ("Sense & Sensibility," the "Harry Potter" franchise), Rachel Hurd-Wood (2003's "Peter Pan") and two-time Academy Award® winner Dustin Hoffman ("Rain Man," "Kramer vs. Kramer"). 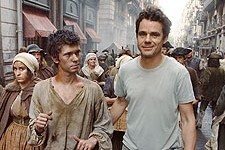 "Perfume" was directed by Tom Tykwer, the award-winning director of "Heaven" and "Run Lola Run." 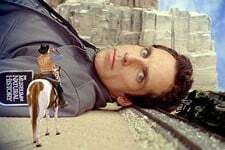 Bernd Eichinger ("Downfall," "The Neverending Story," "The Name of the Rose") produced the film from a screenplay he co-wrote with Andrew Birkin ("The Name of the Rose," "Omen III: The Final Conflict") and Tykwer, based on Patrick Süskind's celebrated novel of the same name. Smells like a European period-thriller hit!